Join us in the 6th annual n.e.r.d. Run, run for Brain Research. We NERDS stick together so we are doing a 10k, 5k and 2.5k run this year! N.E.R.D. stands for Neuroscience Education, Research and Development. Our run is a resounding success with over 300 people attending in 2017. *Registration closes Friday September 13 at 10pm. William Hawrelak Park (originally Mayfair Park) is a 68 hectare park in the river valley featuring a 5 hectare lake and open grassy areas. The park hosts several major festivals and events throughout the year and is a fantastic location for all Edmontonians and visitors to explore. Ample parking is available in Hawrelak Park. Follow the directions of our parking attendants. See map for a detailed view. 12:00pm- Post Race BBQ & Draw Prizing! The event starts in the main parking lot follows Hawrelak Park Road. The 5k event does 2 laps. The 2.5k Walk, Run or Roll event completes 1 lap. 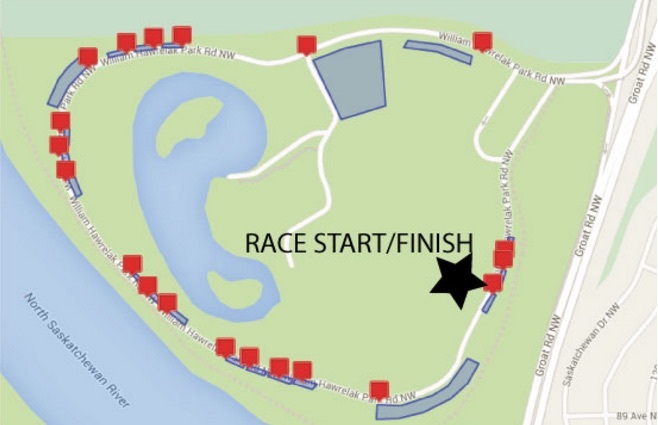 The event starts in the main parking lot and follows Hawrelak Park Road to complete one full lap of the park. Once past the starting point you will pop onto the gravel trail (by pavilion #1) and head east along the North Saskatchewan River trail system. Athletes will turnaround just before groat bridge and then continue along the trail system, coming out of the valley by 76avenue and then follow the paved trail back towards Hawerlak Park. Head down Groat Road to enter the park and return to finish! There are 2 water stations on the 10k run course offering water and sports drink. The N.E.R.D. Run supports Brain Health and Injury Research at the Neuroscience and Mental Health Institute (NMHI) (www.neuroscience.ualberta.ca). Donating to neuroscience research is the single most effective way to advance our knowledge and treatment of brain related diseases and disorders (see below for a list of our research!). The NMHI at the University of Alberta is a vibrant, interdisciplinary community researching every facet of brain health and injury.